For New Year’s Eve I prepared a casserole of salted and dried cod cooked with potatoes, tomatoes, bell peppers, onions, olive oil and cayenne peppers. In Norway we call this dish “bacalao”, which is the word for cod in Spanish. 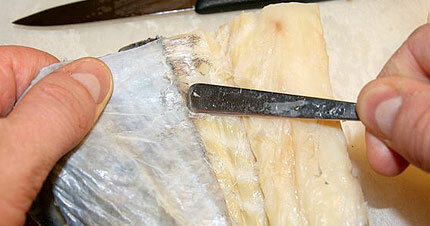 The dried and salted cod is called “klippfisk” in Norwegian. This literally means “cliff fish”, as it was traditionally dried on the cliffs along the coast. Spain and Portugal were, and still are, the main importing countries of “klippfisk” from Norway. Hence the name “bacalao” for the dish. On the Iberian peninsula a number of different dishes are made with “klippfisk”, but somehow the potato/tomato version stuck with us Norwegians. Now, what has this got to do with dissection? Well, the cod comes in chunks with bones and skin. Before cooking, the fish has to lie in water for about 12 hours to rehydrate it and make it less salty. Then the skin and bones has to be removed. I’ve always done this using a sharp knife, ending up with cutting through the skin at some point. So this year I decided to try a technique used in surgery to separate tissues along natural cleavage lines– blunt dissection. Using the handle of a spoon as a dissector I was able to separate the skin from the meat quick and easy (see picture above). When using a knife, some meat are always lost with the skin. With this technique no meat was lost. So what’s next? Monopolar cautery for making black pudding? Leave the fish in a bowl of cold water for 8-12 hours, depending on how salty you want it. Remove the skin (by blunt dissection) and bones and cut it in finger size pieces. Cut the potatoes, onions and bell peppers in slices. Use a large pot and place fish, potatoes, onions and bell peppers in layers. Finely chop the cayenne peppers and sprinkle between each layer. Pour water and olive oil over the ingredients and boil it all for about two hours. Oooh. Almost relevant for my website!! Do it on a raw one next time! Very cool surgically prepared new years fish recipe (will try it out) and a happy new year to you! You are currently reading Blunt dissection of bacalao at The Sterile Eye.